Ann Forrest March 2, 2017 Comments Off on Oh Happy Spring! We were thrilled to receive this photo and message from one of our happy customers. Thank you, Lisanne, for sharing! “I thought you all should see where your saddles end up. 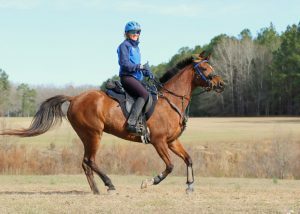 Here is Spring Colors aka Spring in her Lovatt & Ricketts saddle at mile 39. She went on to be first FEI horse in the 80km race. Thank you all for being part of the team at Morning Glory Farm!” Message from Lisanne Cape Dorion, Photo by Becky Pearman.